The 31-year-old's current deal will expire after the 2020-21 campaign and the Barca captain has previously said he would like to return to his homeland with boyhood club Newell's Old Boys. 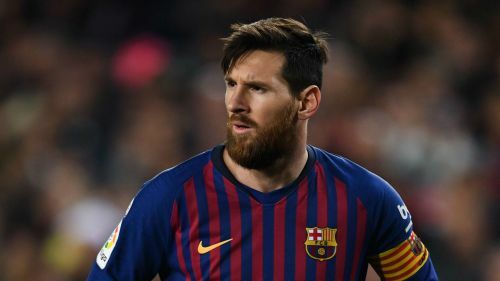 Messi started his career at Newell's but moved to Barcelona as a teenager, developing into an all-time great of the game with nine LaLiga titles and four Champions League crowns. "We are already thinking about it, but it is a future still far away," Bartomeu said to Le Figaro. "He is a young player, he is 31-years-old, his performance is very good, he plays even better and better, I do not know how he does it! "He has a contract for two seasons, but I think he will extend his career beyond 2021. But you have to think of young talent. When Messi no longer plays, no one can replace him. It's impossible. "Behind Messi, there is nobody. Neither in Barca nor anywhere else. The coach of the day will have to think of how the team will play [but] the idea of Barca football will remain the same." Barcelona have been strongly linked with a move for Paris Saint-Germain's Adrien Rabiot, but Bartomeu denied there has been contact between the LaLiga leaders and the France international. "The planning of the club for the next seasons is not yet launched, we will start in March," Bartomeu said of links to Rabiot. "In addition, Barca always puts the priority on the players of our B team. If we do not find them, we will look for them outside. "The only sure thing about Rabiot is that on June 30 he will be free." One player who will be lining up for Barca next season is the Ajax midfielder Frenkie de Jong, with the Netherlands international adding to Ernesto Valverde's midfield options after agreeing a move worth €86million. "He is a player who will mark a time of European football. He has an incredible talent and an understanding of football which is that of Barca... and the same as that of Ajax."